Martin Price isn't your typical teen hero. Broad of accent and craggy of face, he's more your famous-by-association type. But as one quarter - admittedly the noisy quarter - of 808 State, he's guided his band into the charts enough times to be a reasonably regular face at the "TOTP" studio. 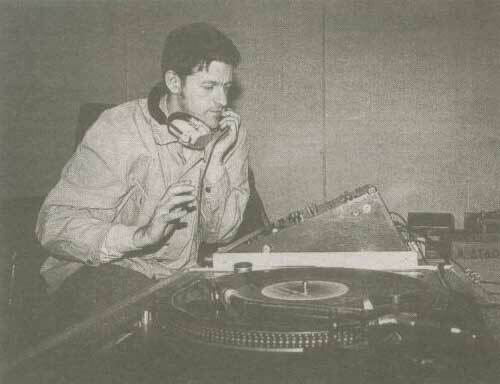 808 State bowed into the record buying public's consciousness a mere two years ago with the Top 10 hit "Pacific State". Another couple of Top 10's later, and Martin, programmer/engineer Graham Massey and DJs Darren Partington and Andrew Baxter - aka The Spinmasters - are living their childhood dreams, basking in recognition not just from the public, but from their own heroes too. Martin: 'We did a re-mix for Arthur Baker. I couldn't believe it - there we were with the master tape. From your bedroom and all your dreams you're there, you're doing it and that's great. All that kind of immediacy over two years. With this technology you're instantly involved in things, and the great thing is, anybody can be. The floodgates are open." Music for the people is a big thing for 808 State, a band desperate to break down the boundaries between audience and band. For them, the pure joy of technology is its availability, its ease of use. Though for Martin, if technology got even easier, he'd be happier still. "What I'd love is something where you can put a needle on a record, and get 15 bars of MIDI information out of it. To me that would be the ultimate dance statement. You could just put all your MIDI info in the last two grooves, then someone else could remix it. Anyone could play that record back into their set-ups and re-mix it." Back in the real world, however, Martin and the other 808ers make do with an impressive array of equipment that documents their roots. Vintage synthesizers dominate the space in their rented unit on a trading estate in Manchester's Ardwick. Not so much a recording studio, as the space isn't acoustically treated and the atmosphere a little, er, sober for final mastering, its the place where 808 State material starts to take shape. Martin: 'We used to do all our writing in the studio. We'd book the time, we had to have a product, and you put yourself under that amount of pressure to get it. That can be really great, and it can be really skit - here's no in-between with it." So in an attempt to explore different ways of working, they moved the bulk of their collective equipment to this central base, where they get together after working on their individual home set-ups. "At home I've got an Atari 1040, Jupitor 8 and a MIDI'd up 808 - that's how I write. The 308's dead good because you et the song go, and you bang in bars at a time, and you're wilding upon it. I think you can't get a feel like 808 and 909. Although they're over-used, I don't think that you can build up a rhythm track as good with a computer as you can with an 808." Martin remains unswervingly passionate about the benefits of vintage equipment; although their writing room boasts one of Roland's latest keyboards, the JD-800 - designed, ironically, with the analogue programmer in mind - Martin remains unimpressed. Is it not built more in line with the demands of dance bands? "Well, sort of. What comes out of the back of the synth is, but the way of getting it and programming it I don't think is particularly user-friendly. I don't think Roland have ever really capitalised on that 909 building block way of programming. I still don't think they're doing it with the JD-800. The sound and everything veers to what the scene wants with its kind of analogue-ey sounds, but the way it's put together and laid out it's still a musicians thing. I still think it's a bit over-complicated. I don't think boffins can ever understand what's going on at ground level." "Well, for a kick off they didn't give us a load of gear when we met them. And the fact is, can you trust a company that's still giving equipment to Dire Straits and guitar bands, but not backing your electro musicians?" Graham Massey, however, who has more of a training in all things technical, is impressed enough to defend it, leaving the pair of them baffling it out in their own old versus new debate. Graham: "I think most synths are basically the same; they're just split into three or four sections, and the JD-800 just fits into it." Martin: "But there's still 900 banks of stuff in it." Graham: "I actually like that, because it encourages you to do it. Take into account that most musicians are dead lazy, you've got to make it easy for them to get original sounds. To go into something like the JX8P, you've got to go into it and understand the architecture of it. But this is much simpler." Martin: "Yes, but stick the Jupitor 8 next to that. That doesn't compete as far as I'm concerned, programming-wise. You open up the memory, you mess around and bang, there it is. That's not like that." Graham: "Well, I think it is." Martin: "Well he's got his head round it a lot more that we have, but I still think that the older stuff is easier to use than the newer stuff, no matter which way you look at it." Graham points to the newly acquired MemoryMoog to illustrate his point. Graham: "This thing we got the other day I find a lot more complicated. There's so many pathways in there on the MemoryMoog and you can lose your way, but on the JD-800 they're dead well laid-out." Martin: "Well, I'll just stick to the Jupitor 8, me. It's dead simple - there's nothing to it at all. It's great for arpeggiated stuff, and now I'm getting good at programming it, I'm getting better sounds out of it than a lot of the other gear. I can visualise a sound and go and get it on that thing. It's dead good." Martin's louder voice signals the last word on the subject, and before blood is spilled, their attention is turned to the process of making 808 music. Martin: "The way we do it changes every time. We don't want to come in with a sample, or two samples, and say let's build a track around this. We've got to have a better idea of the whole thing we're aiming for, and we've got to be able to have a whole idea and explain it to each other before we set off, and use the gear as a tool to get there." Darren: "Although the recording process is different each time, the basic rule to us is that we start with rhythm. Maybe a break beat and/or a drum machine. But people are using break beats in a very lazy way now. They may use just a one bar break beat, or two bar if they're feeling really courageous, but now you can sit your arse in front of Cubase, and come up with a wicked rhythm section, instead of being lazy and just throwing something down." 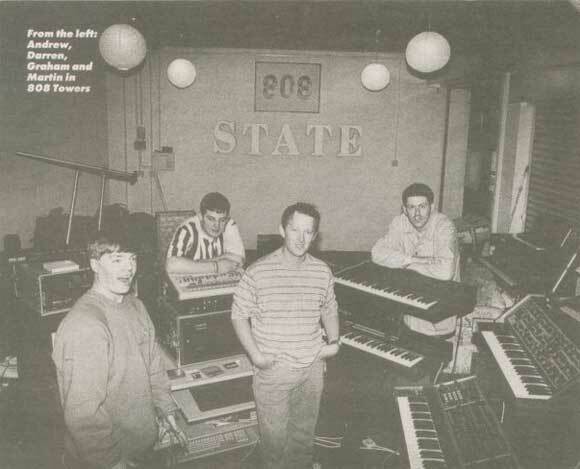 Rather than keeping things running live until the mix, 808 State's preference used to be to commit to tape as early as possible in the recording process. Technological developments, however, have forced a change. Graham: "We're getting away from that a bit at the moment. The place we were working at then had a 1-inch 16-track with a real punchy sound to it. This is a B16, and since we got a bigger sampler - the S1100 - with a mammoth memory, we keep more on disc." There's also been a recent change from Hybrid Arts to Cubase sequencing. "Everyone seems to be going over to Cubase. It's great- like lego. You play something, punch up your grid, and you can see what's wrong with anything you're playing straightaway. You start to learn that in a numeric way as well as in a visual way, and that's great - that's teaching you. It's the best one I've seen." However satisfied 808 are with equipment developments, they still have problems with their place of work. Graham: "Getting the feel is quite important, and that's one of the criticisms I have of this room. I like the fact that we used to go in the studio and do it, because you immediately work off the feel straight away in a good room, where in here, where you're not quite getting that close sound feeling, it sounds removed. That's the thing I used to like about going into the studio to write: actually committing yourself every step down the line." Darren: "And it was like going to work. You'd go there with your head on, but now we're getting lazy." Martin: "But we're exploring the whole feel of it, and finding out where we fit in. We've done that studio stuff, and we've gone through this room now. And now we know that we need our own studio. We want to be able to work on the finished thing from scratch, in our own studio working at our own time. That's our ambition, and that's what we're going to have very shortly . We're tending to think that if we did start things in here, we might not get it to that finite point where it's brilliant." When 808 State do get around to building their own studio, there's no shortage of equipment on hand to help get it off the ground. The trading estate unit that they currently call home is packed with goodies. Graham: 'We bought the basic studio off of someone else for 10 rand: the Fostex B16, rack of effects, JBL G1 1 monitors and TAC Scorpion desk. We had a Scorpion in the studio we first started out in - it's got a hard edge to it, quite a warm, analogue-ey sound. Ideally I'd like something with MIDI - I've got a little MIDI mixer from Tascam at home - just for trimming down after, and for the MIDI mutes. In the studio we rely heavily on the Amek Mozart automation system - we love that. It makes it so easy to carve stuff out when we're mixing." A token nod to contemporary keyboard equipment comes courtesy of the Waldorf Microwave and Proteus 1. 'We've had them for over a year. The Waldorf is just horrendously complicated, but generally I find we're using about four sounds out of it; the 'Scanalogue' is a good one. The big crunchy sound in 'Cubik' is made up of about three or four sounds from the Waldorf, put in an FZ1 and multi-sampled. We still use the FZ because we've got a big library for it, and it's a lot easier to use than the Akai. The Proteus is pretty bog standard - we don't tend to use it a lot, mainly because a lot of people use it. We used the Moog sound on it before we got the Moog." Resting next to the synth modules lies an old 909. "We use that a lot, mainly as a writing tool. It's still got the best bass drum on the planet. There's things in it that nothing else does. We still use the trigger on the back quite a lot for triggering 101s and Pro-One's that we use a lot. Plus it's got an external sequencer on it that works independently of the drums, which we've also used an awful lot because it's dead visual. We used to use that a lot for bass lines - it's especially good for locking to a drum beat that you might have swung." A Korg DVP- 1 voice processor is used for "really cheesy 10cc-type vocal sounds", and the Roland JX8P is another favourite. "There's a whacking bass on that. You have to doctor the pre-set, but it's got a gorgeous sound to it. It sounds very analoguey for a digital synth. It's got a warmth to it. The only other digital stuff we've got is a Bit One and a Bit 99, these weird Italian keyboards that Chase used to bring in, which are great for hard, digital sounds." Martin: "We use the Roland SH09 - it was the first synth I ever had. You can get all the 808 sounds out of it- it's all the same chips and everything. I used to use that and an ARP bass sequencer, and that was my set-up. There's a real purity to it. That ARP Axe has got a distinctive sound as well, though that's knackered at the moment. It' s hardboard city. They've just got a really nice sound on the filters. The MiniMoog we've got is the actual one from 'Video Killed The Radio Star'. We use that an awful lot, triggering it via the CV gate. We sample it too. Other than that, there's the old Pearl Syncussion, which you can trigger off via the channel inputs to make it part of the drum machine sound, and the R8, which we used a lot at the start, but you tend to get bored with it. The sounds are dead dry." The FX rack has the ubiquitous Quadraverb and SPX90, but a curious one-unit yellow box is this week's favourite. "It's called the Space Lock and it's made by Solus Systems. It' s basically a danger, but it's got a trigger so you can trigger it at any point in the track. We've had it in the rack fora year but never used it until recently. You can overload it and make things sound dead metal." With all this equipment, old and new, to hand, I wonder if there's anything 808 State would like that hasn't been invented yet. Martin stares heavenwards, and a smile cracks his lips. "Oh yes . . . a vocal box. Something that can just sing the songs for you - that would be brilliant. We've already got rid of Dozy, Beaky Mick and Tich, now let's get rid of Dave Dee." 808 State's single, "lift", was released last week.